Any area where there is a high concentration of houses is likely to put extreme pressure on the surrounding drainage infrastructure. Much of this will result from wear and tear as part of normal usage, but misuse or accidents are likely to quickly accelerate drainage breakdown. Putting fats down the sink after cooking (which will then solidify in the pipe), flushing sanitary products down the toilet and using too much washing powder are all common causes of blockages. Pipe fractures can be caused by laying patios, fences, tree roots or simply ground movement. While these actions may seem innocuous enough, the results can be very severe. If left untreated for too long, leaking pipes can actually cause subsidence, which damages the very structural integrity of a building. Property is the most valuable asset that housing associations have, and ensuring drains are well maintained is a key way of protecting it. As soon as an association suspects there may be a problem with drainage, it should call in a specialist drainage company that will be able to complete a full survey, identify the cause of the problem and suggest the most viable solution. However, managing drainage in a housing association environment can be a delicate matter and getting the problem fixed, quickly is not the only consideration a maintenance manager will have. When drainage goes wrong in or around a home, it can be a surprisingly difficult time for the resident, and the housing association will have strict SLAs to comply with. Bad odours will cause distress and flooding will cause damage, not to mention any environmental health issues due to raw sewerage. On top of this, often the diagnosis will be that excavation will be necessary to repair the damaged piping, and the ensuing noise and disruption, and the prospect of having a prized flowerbed or patio dug up can be very troubling. Working with a drainage specialist who is trained in supporting customers during this time is a given, as indeed is working with a company who have trained their operatives in the careful restoration of gardens after the repair work has taken place. Better still is working with a company who have the technology to repair drains without the need for any of this disruptive excavation. No-dig technology is a specialism of UKDN-Waterflow, and take-up among our customers is growing rapidly. Analogous to the keyhole surgery now prevalent inUKmedicine, it allows drainage engineers to carry out permanent and watertight localised repair of sewers and drains without having to excavate the area. After applying a high pressure water jet in order to clean the drain or sewer, and ensure that the damaged area is not hidden by scale, debris or sludge, a CCTV camera is inserted into the pipe in order to clearly identify the broken section of drain. Once the damaged area has been identified, they will then diagnose the most appropriate repair method. Sometimes, the location or type of the damage to pipe will mean that they have no choice but to excavate, though increasingly a no-dig repairs can be recommended. The two most common types are ‘cured in place pipe’ (CIPP) lining repairs, either for larger lengths or the full length of the sewer or drain, or for more localised areas of damage, a small ‘patch’ repair. A CIPP lining is a repairing pipe in the form of a flexible felt tube impregnated with a resin, which is placed and inflated within the original damaged host pipe. This then produces a new pipe within the host pipe after the resin cures, meaning that the area is once more fully watertight. When a pitch fibre pipe has collapsed or become otherwise deformed, it can be re-rounded by a special tool which is drawn through the pipe, restoring its original shape. Once the correct shape has been reinstated, a CIPP lining is then inserted and, using water pressure or air, applied to the inside of the old pipe, providing a permanent repair. Where the affected area is more localised, a patch repair is often more appropriate. The patch, which is prepared on site to match the size of the specific area in question, consists of a glass fibre mat impregnated with resin which has a time delay catalyst. The patch is then wrapped around an inflatable pipe packer which is used to transport the patch from above ground to the affected area in the drain. Once a CCTV camera has been used to check that everything is properly aligned, the packer is positioned within the pipe in order to ensure that the patch adequately covers and repairs the broken section. The packer is then inflated with air, which applies pressure against the patch on the pipe wall in order to bond it in place. In this way, the patch is held in position until the resin has cured and it is effectively glued against the wall. Only then is the packer deflated and removed, leaving the watertight patch in place over the damaged section and the pipe back in full working order. These localised repairs save a considerable amount of money and are completed quickly without disruption to the residents. Perhaps most significantly, working with a company who can offer no-dig techniques can save organisations considerable amounts of money – the reduced labour and energy costs for no dig techniques means that a cost saving of up to 75 per cent is achievable. Similarly, because there is no need for invasive action the risk to assets is enormously reduced. On top of this, carbon savings of up to 90 per cent are achievable. 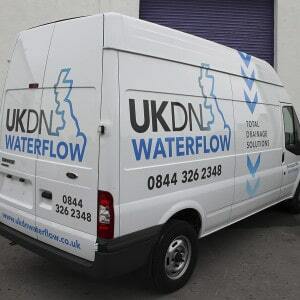 UKDN Waterflow are also saving their social housing client up to 60% on their standard repair budgets by correctly identifying damage which is now the responsibility of the Water and Sewerage company following the transfer of private sewers in October 2011. Of course, in some situations, excavation is unavoidable, but a good drainage engineer will seek to minimise disruption for their customers, and will always explore all options before concluding that digging up the area to get to the pipe is the only possible solution. Undoubtedly, where practical, a no-dig solution will have the best outcome not only for the housing association, but for its tenants too.